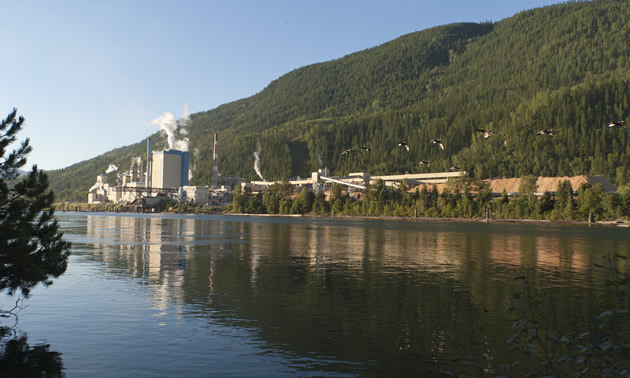 For more than 50 years the Zellstoff Celgar pulp mill near Castlegar, B.C., has been a major employer in the West Kootenay. When construction of the mill began in 1959, the jump in employment, eventually including more than 300 permanent jobs, resulted in an influx of residents to the region and a strong new flow of cash into households and the local economy. Today, Celgar continues to provide community-supporting employment for many West Kootenay residents, and the mill operation is a key contributor to the local forest economy. Celgar consumes more than 2.6 million cubic metres of wood fibre annually and is committed to sustainable forest management. The mill purchases residual sawmill chips and low-grade timber from forest licensees across southern B.C. and is a key customer for many local forest operations. Celgar’s main product, pulp, is sold worldwide and used mostly in tissue, toweling and hygiene products. In addition, the mill’s investment in technology generates enough “green” energy to meet all of its own power needs and a surplus sufficient for approximately 20,000 homes, that it sells to the local power grid at “Eco-Certified” rates. The environmental control devices at the mill use the best available technology, resulting in substantial air quality improvement in the last 10 years, and some of the lowest pulp mill emissions in Canada. Area residents enjoy the benefits of having a large employer and industry taxpayer in their community and the generous support of Celgar and its employees for many non-profit groups, sport groups and community events. The company also contributes to community projects like the Sculpture Walk and the new Celgar Pavilion, an esthetically beautiful, multi-use public facility in Millennium Park.